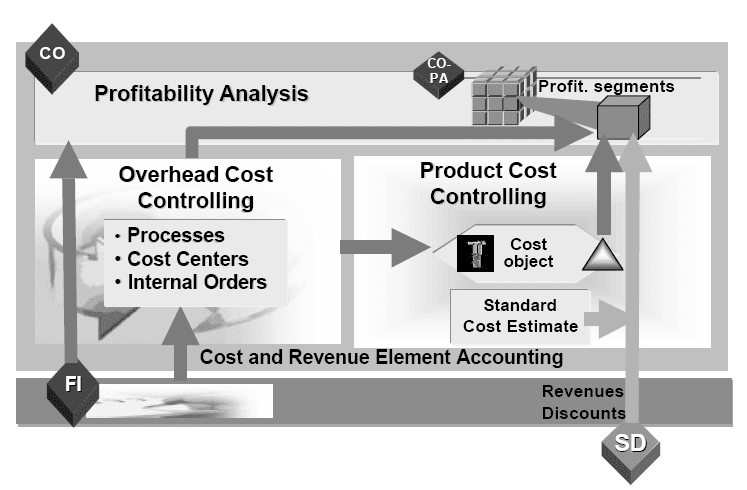 Your company's management would like to implement a profitability accounting application in the SAP R/3 System.As a member of your company's project team, you are supposed to provide advice on the question of whether to implement CO-PA and/or EC-PCA in the R/3 System.You then will be responsible for implementing the selected applications. Two accounting methods used for generating profitability statements are the cost-of-sales method and the period accounting method. Applying either method to a given set of business transactions under a given set of laws yields the same bottom-line result (profit) in concept. The difference is in how the overall profit and loss picture is presented.Companies must choose to use one of these methods for generating their legal financial statements.The choice is often determined by country-specific legal requirements. However, the methods facilitate two different types of analyses, both of which a company may want to conduct, so internally there may be efforts to track information in both manners. 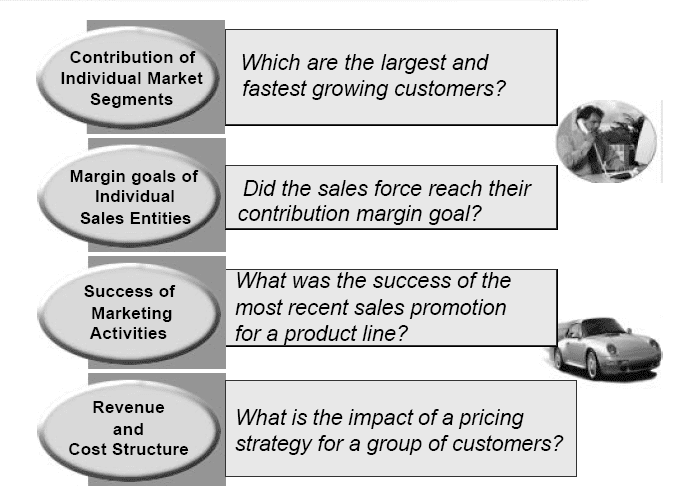 With this method, the emphasis is on matching the revenues for goods and/or services provided (the value that a company gains as a result of sales) against the related expenses for those items (the value that is lost when products are transferred out of the company). 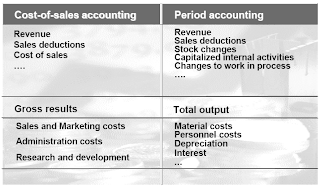 Therefore, this accounting method displays profit and loss information in a manner optimized for conducting margin analyses, and as such it is optimal for the sales, marketing, and product management areas. CO-PA lets you analyze the profitability of segments of your market segments structured according to products, customers, orders, and summarization of these and other characteristics as well as organizational units such as company codes or business areas. The aim is to provide your sales, marketing, planning, and management organizations with decision-support from a market-oriented viewpoint.Responsibility Reporting:n The business purpose of Profitability Analysis is to provide Profitability-oriented performance information on a company's market segments or sales channels, in order to support corporate planning and decision-making, especially in the areas of sales and marketing.The definitions of both 'market segments' and 'performance figures' are freely definable, allowing for maximum flexibility in market evaluation. The definition of a market is configured in the system through the selection of characteristics that are to be the subjects of analyses. Performance figures may either be profit and loss account balances or freely defined value fields. Market segments are normally some combination of information regarding customers, products, and the selling organization. 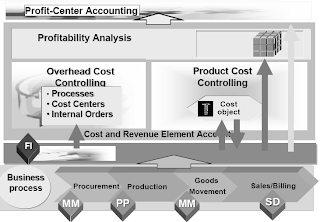 Performance figures are normally measurements of quantities, revenues, discounts, surcharges, product costs, margins, period costs, etc.The results of Profitability Analysis can be analyzed with a multidimensional reporting tool, which allows the dynamic sorting and rearranging of data to provide multiple perspectives within a single report. EC-PCA lets you analyze internal profit and loss for profit centers. This makes it possible for you to evaluate different areas or units within your company. 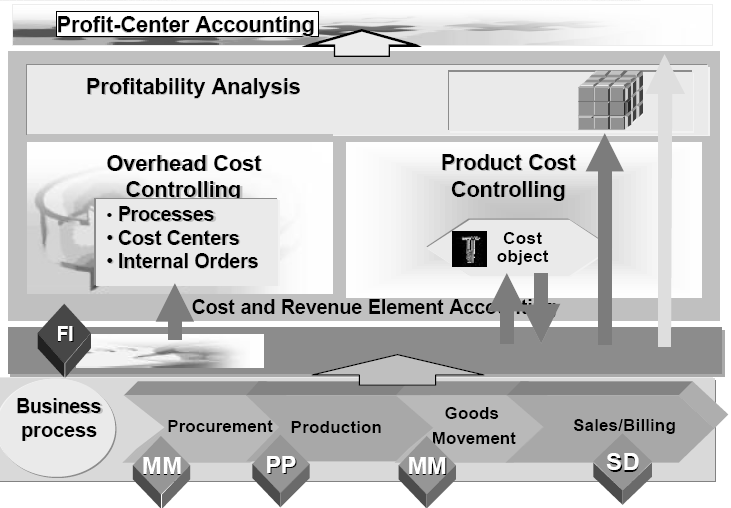 You can structure profit centers according to region (branch offices, plants), function (production, sales), or product (product ranges, divisions).Profit Center Accounting is a component of the module "Enterprise Controlling". EC-PCA lets you calculate internal operating results for profit centers. A profit center represents an organizational subunit that operates independently on the market and bears responsibility for its own costs and revenues. 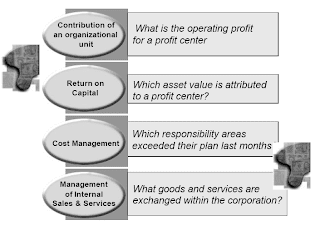 You organize your organization into profit centers by assigning the master data of each profit-relevant objects (materials, cost centers, orders, projects, sales orders, assets, cost objects, and profitability segments) to a profit center.All the business transactions in the R/3 System which are relevant for cost and profits are updated in the profit centers at the same time they are processed in the original module, and organized according to cost and revenue elements. This transforms all the flows of goods and services within the company into exchanges of goods and services between profit centers. This profit center structure applies for both actual postings and profit center plan data.It is also possible to treat a profit center as an investment center. In addition to the flows of goods and services, you can transfer selected balance sheet line items (fixed assets, payables and receivables, material stocks, and work in process) to profit centers on a periodic basis. This makes it possible to calculate such key figures as profit on sales, return on investments and cash flow. The method of determining period operating results in Profitability Analysis is based on the assumption that a company's success can be measured primarily on the basis of its transactions with other companies. The aim is to supply the sales, marketing, product management, controlling, and corporate planning teams with decision-support information.This sales-oriented approach in CO-PA means that no contribution to the organization's success is made until a sales transaction has been completed. Consequently, the products sold are transferred to CO-PA in accordance with the cost-of-sales accounting method and provide information on the sales revenue and sales deductions. This net revenue is then compared with the cost of sales. These costs consist of the cost of goods manufactured of the products sold or services rendered plus any production variances known.To round off your profitability data, you can also assign overhead costs to profitability segments in the course of your period-end closing activities. Actual Postings represent the most important source of information in CO-PA. You can transfer both sales orders and billing documents from the Sales and Distribution (SD) application component to CO-PA in real-time. In addition, an interface program is available to let you transfer external data to the R/3 System. 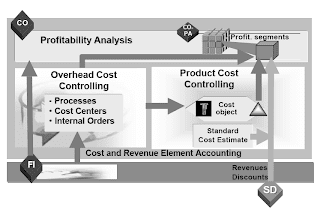 You can also transfer costs from cost centers, orders and projects, as well as costs and revenues from direct postings (G/L account postings in FI, orders received in MM, and so on) or settle costs from CO to profitability segments.In costing-based CO-PA, you can valuate incoming sales orders or billing documents to automatically determine anticipated sales deductions or costs. You can also revaluate your data periodically to adjust the initial, real-time valuation or add the actual costs of goods manufactured.